A rare transit of Venus can be observed June 5-6, 2012. Plot the path of Venus as the planet's disk moves across the face of the sun. Submit data to coordinated international observation efforts, such as was done for the June 8, 2004 transit of Venus by the European Southern Observatory and Venus Project. When done, keep the plate as a souvenir of this historic event. See www.transitofvenus.org for details on this celestial spectacle. 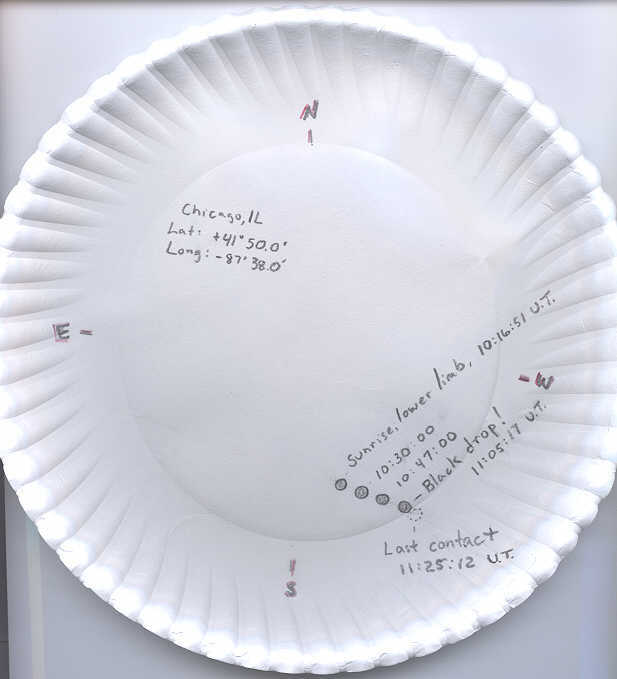 The sample plate shown is for an observer near Chicago, where the sun rose in 2004 with the transit well underway. Sample times are shown on plate in Universal Time (UT). Actual times will vary according to your location. 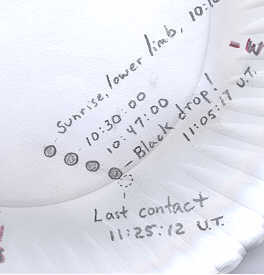 Use the flat inner part of the paper plate as the disk of the sun. Include notes and draw sunspots where applicable. Notice that the event at 11:05:17 UT is labeled as "black drop" instead of third contact. The "black drop effect" often prevents the observer from determining with certainty the time when the disk of the planet appears to touch the edge of the sun. 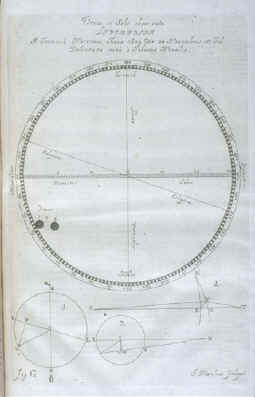 Jeremiah Horrocks, who at about 20 years of age observed the first recorded transit of Venus in 1639, had predicted the transit after correcting the often-reliable mathematical tables of accomplished astronomer Johannes Kepler. Horrocks' observation reproduced at left, recorded in the last half hour before sunset, is excerpted from A Sourcebook in Astronomy by H. Shapley & E. H. Howarth. It is modeled after Johannes Hevelius' interpretation (right) of Horrocks' notes; image courtesy of Smithsonian Institution. 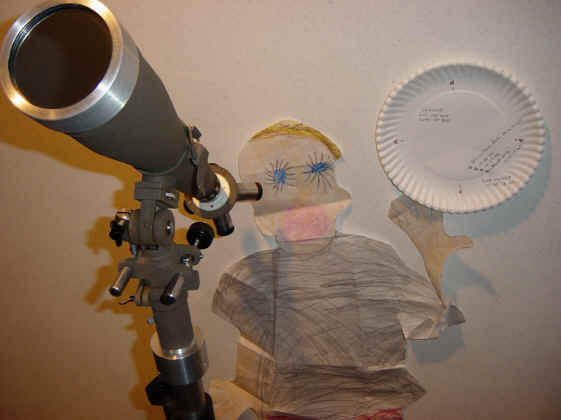 In practicing for the transit, Flat Stanley recognizes that a proper solar filter must be used to keep his eyes (and the rest of Stanley) from burning. Extensive links related to the transit of Venus are at www.transitofvenus.org. The Smithsonian Institution Libraries presents an extended version of this activity at http://www.sil.si.edu/exhibitions/chasing-venus/teachers/lessonplan5.htm.